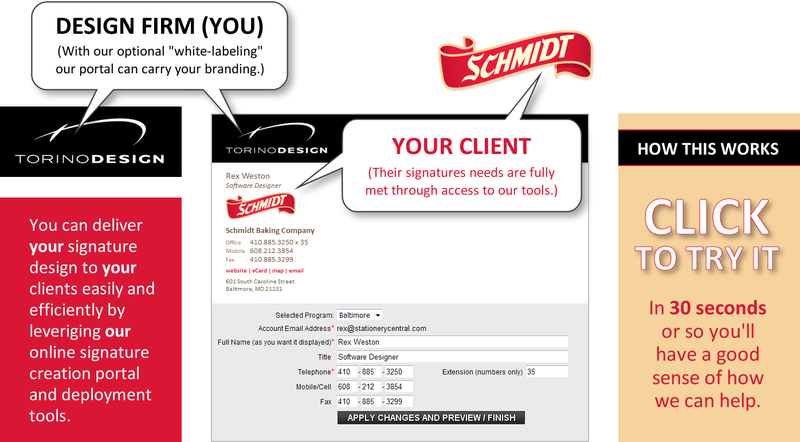 then upload it into our cloud-based email signature generator (which can be “white-labeled” for you - see graphic below). along with our automated signature creation and deployment tools (as they best fit your client’s needs). while we remain available to handle all of the ongoing maintenence and support. Customizing signatures for individual user requirements while adhering to brand standards. Providing easy-to-use email signature deployment tools and instructions appropriate to various email programs and devices. Creating signatures for new hires and managing signature edits for existing users. Managing special promotional announcements, etc., that clients temporarily wish to have added to their signatures. Successfully placating disgruntled users as they encounter the occasional, but inevitable, problems surrounding the use of HTML email signatures. Providing ongoing support and technical assistance as email programs change and evolve. When the development of an email signature is just a small piece of the overall scope-of-work with your client, farming it out to an expert makes good sense - after all, it is your client’s ultimate satifaction that matters the most. By delivering a state-of-the-art email signature service you’re going to look great! About how many people in your client's company or organization will need email signatures? Where are you at in the design process? We'd like you to provide us with design(s) for consideration. We're planning to do the design, but have not yet completed the process. We have draft design(s) but we'd like your technical review before sharing them with our client. We have completed the email signature design process and have received client approval. Great Service / Non-Compete: Any concerns you may have regarding the quality of the service we’ll offer your clients should be alleviated by reading what our clients have to say. Also, as you can see from our website, we offer no services other than email signatures, so we pose no threat to your ongoing business relationship with your clients. Our Interaction With Your Client: With a web-based service that relies on servers, domains, and URL’s, it would be virtually impossible for us to be truly invisible to your client. Given this, we will work with you (and your client) in whatever way you feel is most appropriate. On one end of the spectrum, we can invoice you, establish contacts with you only, and have you be the intermediary between us and your client for any support issues that come up. We’ve found over the years though that support is best provided directly to the customer, design and signature content direction is best handled through you (the designer), and the approach to invoicing doesn’t matter at all. Note that we are absolutely clear that what we are doing is working for you, in the provision of a service that your client needs.